Franklin Burroughs is the author of three books and many essays, both personal and academic. Billy Watson's Croker Sack (1992), a collection of essays about the outdoors, was published in 1991; it was selected as an Editor's Choice by The Book of the Month Club, was reprinted by the Quality Paperback club, and was translated into Japanese. 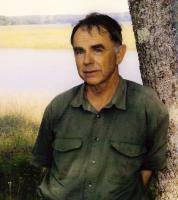 Horry and the Waccamaw, a nonfiction narrative, was published in 1992 and reprinted in paperback (as The River Home) the following year. Confluence: Merrymeeting Bay was published in 2006. His essays have been published in Harper's, Backpacker, Kenyon Review, Sewanee Review, and many other magazines, and have been reprinted in Best American Essays and The Norton Anthology of Nature Writing. His essay "A Snapping Turtle in June" was the lead essay in the Pushcart Prize Anthology for 1988-1989, "Compression Wood" appeared in Best American Essays in 1999, and the following essays were given honorable mention by Best American Essays: "A Pastoral Occasion" (1987), "Of Moose and a Moose-Hunter" (1990), "Passion or Conquest" (1998), "Return to Rivertown"(2003), and "Moving On" (2004). His work has been honored by a 1994 National Endowment for the Arts fellowship, by the Editor's Prize, given for the best essay "Lost Causes and Gallantry" published in The American Scholar for 2003, by the editor's prize for "Deceptions of the Thrush" awarded by the Sewannee Review in 2005, and by the Cecil Woods, Jr. award for creative non-fiction (2005), given annually by the Fellowship of Southern Writers. Franklin Burroughs was born, raised, and received his elementary and high school education in Conway, South Carolina. A graduate of the University of the South, Franklin Burroughs took the M.A. and Ph.D. degrees at Harvard and served as Professor of English at Bowdoin College from 1968 until his retirement in 2002. He is married to Susan Hay and they have three daughters Coles, Elizabeth, and Hanna. As a writer, I have followed my nose. I like the suspense of something taking (or not taking)shape, without foreknowing what it or its shape will be. My materials usually involve the geography of my life, and almost always involve memory. Its unexpected associations and odd tangents ideally suggest not simply the content but the structure of essays. I have longed for the world of critters -- for rivers, woodlands, marshes, and swamps -- as far back as I can remember, and that shows in the writing. The natural and human ecology of my childhood remain half-present to me and conditions how I think and what I notice.